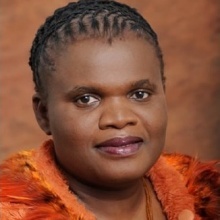 Ms Muthambi is the former Minister of Communications of the Republic of South Africa, with effect from 26 May 2014 until 2017. She is a Member of Parliament of the Republic of South Africa and had been a member of the Pan African Parliament from 2009 to 2014. She served as a chairperson of Thohoyandou BMF branch and remains a member of the branch. She is currently a member of the Provincial Executive Committee of the African National Congress in Limpopo, a member of the Provincial Working Committee and a Convener of the Legislature and Governance Sub-committee. Ms Muthambi is an admitted attorney of the High Court of South African, a member of the Black Lawyers Association and of the South African Women Lawyers Association. She was a member of South African National Students Congress between 1989 and 1990. She served as Secretary of the Tshimbupfe branch of the African National Congress Youth League (ANCYL) in Limpopo from 1991 to 1992. From 1992 to 1993, she was a member of the Executive Committee of the Tshimbupfe ANC branch. She was Deputy Secretary of the ANC Vuwani Zone from 1993 to 1999. She was Whip of the Portfolio Committee on Communications and served in the Standing Committee on Public Accounts (SCOPA). She has worked as a Senior Manager: Corporate Services, Legal advisor and Municipal Manager in various Municipalities in Limpopo, and as Manager: Labour Relations in the Limpopo Premiers Office. She has served as a member of the Regional Executive Committee of the ANC in the Vhembe region since 2006. Ms Muthambi became a member of the ANCYL REC & PEC respectively, and Provincial Treasurer of the ANCYL in Limpopo from 2005 to 2008.